Today is the 150th anniversary of Abraham Lincoln's "Gettysburg Address". 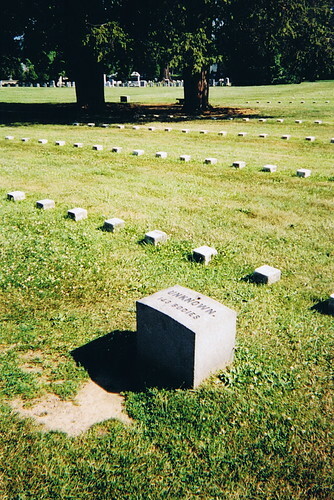 Two hundred and seventy-two words were all that was needed to consecrate the ground under which so many Union soldiers were buried. Filmmaker Ken Burns, whose seminal series "The Civil War" not only defined the documentary genre, but also helped reexamine the causes of that war and how far we have or have not come from it, has added another project to his vast stable of projects. It's called "Learn the Address". On the web site, www.learntheaddress.org, you find the stated purpose of this project. To celebrate the 150th anniversary of the Gettysburg Address, documentarian Ken Burns, along with numerous partners, has launched a national effort to encourage everyone in America to video record themselves reading or reciting the speech.The collection of recordings housed on this site will continue to grow as more and more people are inspired by the power of history and take the challenge to LEARN THE ADDRESS. There are also a number of people shown reading or reciting the address. You can click on their portrait to listen and watch. I hope, eventually, the faces rotate from the current batch of public figures to include members of the general public, the "John Smiths" and "Mary Wilsons" of the country; every age and every ethnicity; reciting or reading this address. I have a lot of things stuffed into my head. This morning I tried to remember to bring a couple boxes to the Jeep which need to be mailed. I started the Jeep and commenced scraping the windshield and then remembered that I'd told myself to remember the boxes. Some days, I fear what I had before is not what I have now. I also remember, back in college, two of my professors required memorization of texts studied in class. They said memorizing something then would stick with me for the rest of my life. I do remember the lines I memorized from "Rime of the Ancient Mariner" by Samuel Taylor Coleridge, but I don't remember all of the eulogy of Julius Caesar spoken by Marc Antony in "Julius Caesar" by Shakespeare. In case you don't know to what I'm referring, it's the "Friends, Romans, countrymen, lend me your ears. I come to bury Caesar, not to praise him," speech. When I mentioned to my doctor that I feared something was awry with my memory, he said nothing is wrong. I'm just trying to remember way too much. He said that although those of us who went to college think of it as being the height of needing to remember things, that is not the case. As we age, there are more things we are tasked with remembering. While that keeps our brains from atrophying, if we don't have tricks to remember things, such an mnemonics, the reason we went to the grocery store is lost. I think about the visit Carole and I made to Gettysburg. We went to the cemetery on our second day. It was a beautiful June morning. 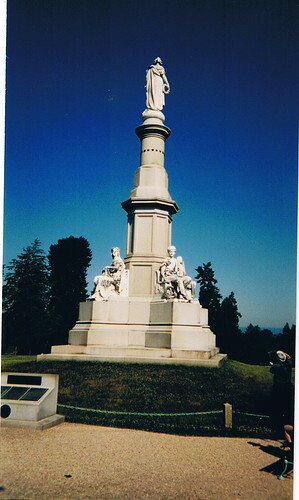 The Soldier's National Monument is at the center of the cemetery. This ground is quiet. It's like everyone who was there, and there were a number of people walking about, knew it was hallowed ground. The noise from the surrounding roads just seems dampened. This monument, it should be noted, is not at the location of the dais on which Lincoln spoke. That exact location has been the subject of discussion. I've decided to try to memorize the address. We all learned "Four score and seven years ago, our fathers brought forth on this continent, a new nation; conceived in liberty and dedicated to the proposition that all men are created equal." Beyond that, we often quote the ending lines, "...that government of the people, by the people, and for the people shall not perish from this earth." In between are 224 words that need to be memorized. I didn't realize, until reading up on Ken Burns' project, that there are five versions of the speech. They differ a bit in language but the differences are minor. I have decided to memorize what's called the "Bliss Copy". It is the version reprinted the most; the only copy signed and dated by Lincoln himself; and is version on the walls of the Lincoln Memorial. I urge you to consider committing this to memory. Will it change the world? Possibly not. I have come to believe that government is not, "of the people, by the people and for the people". Lincoln himself was a product of Republican behind closed doors deal making in order to get nominated for President. I think he was looking idealistically at what could happen once the war was over, in spite of his not being the President "of the people" in the South. Yet, who knows. Maybe if we commit this to memory, 272 words will remind us that all people are created equal and that government is for us. It can't hurt. Plus, stretching one's mind to memorize something is a good way to keep it healthy. But, in a larger sense, we can not dedicate -- we can not consecrate -- we can not hallow -- this ground. The brave men, living and dead, who struggled here, have consecrated it, far above our poor power to add or detract. The world will little note, nor long remember what we say here, but it can never forget what they did here. It is for us the living, rather, to be dedicated here to the unfinished work which they who fought here have thus far so nobly advanced. It is rather for us to be here dedicated to the great task remaining before us -- that from these honored dead we take increased devotion to that cause for which they gave the last full measure of devotion -- that we here highly resolve that these dead shall not have died in vain -- that this nation, under God, shall have a new birth of freedom -- and that government of the people, by the people, for the people, shall not perish from the earth. "Rubber duckie, you're the one"